Hundreds of thousands of taxpayer dollars have supported Nation of Islam activities over the last decade, according to a report released Wednesday. The Washington Examiner‘s Alana Goodman, formerly of the Washington Free Beacon, found that the Nation of Islam (NOI) received federal funding to teach religious programs in prisons around the United States. The black nationalist group began receiving funding in 2008 and operated in prisons in Indiana, Pennsylvania, South Carolina, Arkansas and Michigan, records show. 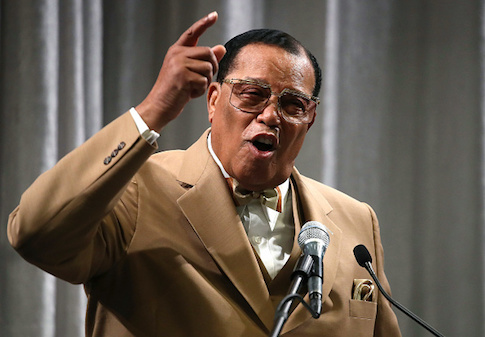 Radical NOI leader Louis Farrakhan has called Jews "termites" and called Hitler a "great man." He is the author of The Secret Relationship Between Blacks and Jews, which accuses Jews of propagating the African slave trade and controlling the global economy. He believes Jews committed the 9/11 attacks and that white people are artificially engineered sub-humans. The Anti-Defamation League describes the NOI as having "a consistent record of anti-Semitism" since the 1930s. The Southern Poverty Law Center has designated it an "extremist group" or "hate group." The Department of Justice and Bureau of Prisons provided NOI with at least $364,500 in contracts and awards, according to the Examiner. The funding went to NOI under line items like "Nation of Islam religious services," "Nation of Islam spiritual guide services" and "Nation of Islam study services." Federal regulations require prisons to provide reasonable religious accommodations, and to screen and review materials allowed into prisons. Though the funding reached its peak under President Barack Obama in 2012, it has received tens of thousands of dollars since President Donald Trump took office. The United States is in auspicious company in its government support for the NOI. In November, Farrakhan traveled to Iran to meet with state officials and deliver public remarks in which he called the United States "Satan." Deposed Libyan strongman Muammar Gaddafi also strongly supported the NOI, according to the SPLC. In 1996, Gaddafi made headlines again when he tried to donate $1 billion to NOI and another $250,000 specifically for Farrakhan as an honorarium. Officials from the Clinton Administration blocked the "gift" citing regulations that barred negations with Libya due to strong evidence that pointed to Libya’s involvement with terrorist activity. Democrats have a mixed relationship with the organization and its longtime leader. Chelsea Clinton called on Democrats to condemn Farrakhan following his "termites" comment. Her father, President Bill Clinton recently shared a stage with him. In March, the New York Times documented some of the prominent Democrats, including President Barack Obama, who have been photographed with Farrakhan or defended the NOI. Leaders of the Women’s March have been pressured to condemn Farrakhan based on their association with the minister. They have worked with NOI and gone on to deny working with the group. March founder Theresa Shook calling on Bob Bland, Tamika Mallory, Linda Sarsour, and Carmen Perez to step down in November. The leaders initially dismissed Shook's criticism, but Sarsour also said the same week that Farrakhan has "said hateful and hurtful things and … he does not align with our Unity Principles." She also, however, complained about being forced to condemn the NOI leader, saying having to answer for the conduct of other Muslims was a feature of "white supremacy." Rep. Peter King (R., N.Y.) criticized the use of federal resources to fund NOI activities. "Categorically, no group or entity or individual associated any way with Farrakhan or the Nation of Islam should receive any federal funding," he said. "What Farrakhan preaches is hatred and anti-Semitism and racism, and to use any federal money for any group that’s he’s involved with that do any type of teaching or proselytizing is just wrong." This entry was posted in Issues, Politics and tagged Louis Farrakhan, Prison. Bookmark the permalink.